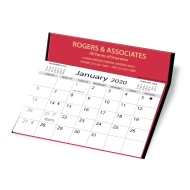 Imprinted desk calendars are an attractive and affordable way to promote your agency for the next 12 months. 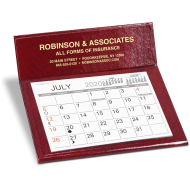 This small desk-friendly format has become a favorite for any insurance agency interested in running a successful business-to-business promotional campaign and looking to solidify brand recognition. 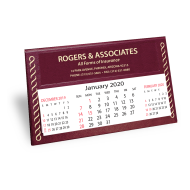 Using personalized desk calendars for your next promotional campaign will ensure daily exposure for your agency for at least 365 days. They are easy to read; yet they don’t take up a lot of room on a desk, thanks to a built-in easel that keeps them upright. They can be used for any industry, but they are especially popular with insurance agents, real estate agents, mortgage brokers, and financial planners. 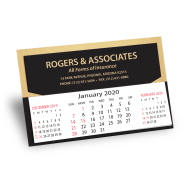 Best of all, promotional desk calendars have a large area for your insurance agency's imprinted logo – often stamped in gold or silver foil – so it will stand out all year long. Start enjoying a full year of promotional exposure with this time-proven marketing tool!